Hey, in a couple months, I can say I’m actually published – in print, no less. 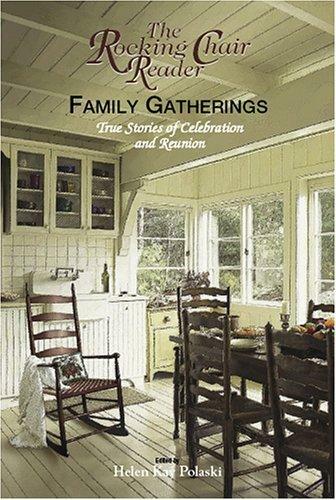 Helen Polaski e-mailed me today that my story The Homecoming (a narrative account of my daddy’s annual family reunions) will definitely be in The Rocking Chair Reader Family Gatherings. Ain’t that a hoot? Adams Media (TRCR publisher) encourages book signings, interviews, etc. and I’m going to see if I can’t swing one or two book signings when GRW has a local one. If I do, I’ll post a picture of my very first book signing right here on my blog. The little things that make us writers happy. I swear! This entry was posted in Books, Carol Burnside, Everyday blather, Good News, Here at home, Pics, Promo and tagged Adams Media, new release, print book, The Rocking Chair Reader. Bookmark the permalink. >Thanks, Lynn, and again for the reminder. I’ll get it to Michael. >Congratulations, Carol!!! What a beautiful cover, too. You go, girl!